I had read up on a few travel blogs on Bali and scanned the accommodation options on TripAdvisor for starters on what I should expect and plan. Since we had only three days, I knew I had to plan carefully. I dislike having every waking hour of activity yet at the same time look to optimize the time spent at a place. 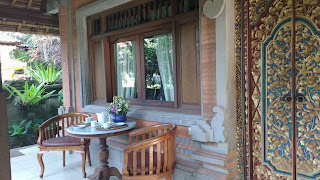 I narrowed down on Ubud as our base in Bali. Somehow, it seemed just right for our taste. Beyond this, I got stuck. Tour planner or self-planned; B&Bs or hotels? I found the right person who had been to Bali a couple of years ago and was happy to share the details I needed. Getting a first-hand opinion on what places to avoid and which ones to include helped clear the fog in my head. I'm always a wee bit anxious while finalizing the accommodation on the basis of online reviews. There's always a tiny voice of apprehension at the back of my mind until I reach the place and testify myself. Though, I must say that the likes of TripAdvisors have rarely let me down. Yet, the operating word here is rarely. I needn't have worried. Our hotel was as beautiful as I'd imagined. Bali is tourist-friendly; we felt welcomed and warmed up to the friendly faces we encountered throughout our stay. Even locals seemed to reflect a sense of calm and inner happiness off their faces. The spot looked busy with travelers swarming in and out of the changing rooms and the instructors handing over safety instructions and sports gear to the ones that signed up for a particular sport. M and N are water sports enthusiasts and have done some extensive scuba diving while in the US. They were, however, not too keen this time. By contrast, C and I were rookies and tethered on the border not being able to decide between opting for kids-oriented sports or plunging into the deep waters (quite literally!). Holidaying with kids meant that we had to prioritize. 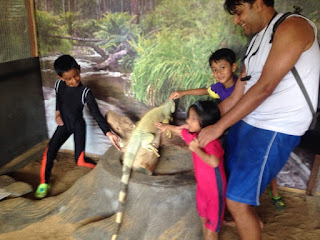 We also didn't want to spend all day at one beach, so N helped us take a quick call: He and M were to take the kids to a turtle island while C and I were to experience the underwater sea walk. Scuba-diving seemed out of scope for two reasons. One, both of us are non-swimmers. And the second, and more important one was, although we have the appetite for some adventure, we are not entirely the bindaas kind and prefer to take one step at a time. We had no idea what kind of experience was awaiting us. We quickly changed into the appropriate swim gear. The kids, M and N and we hopped onto two different boats. I had butterflies in my stomach; of excitement and nervousness. I asked C and he said he felt similar. We linked hands and giggled in anticipation. Savoring the kid-free moments, we watched in happy silence the calm waves that bobbed up and down the sides of our boat. We cruised to a certain point, then disembarked onto a bigger boat that doubled up as our base for our underwater activity. There were a few others before us. As the instructor helped them wear the oxygen mask and briefed them about what to expect, we lapped it up as earnest students waiting to experience it all. Our turn came and my heart beat faster. Wearing the diving shoes and donning the diving helmet, C was the first to climb down the ramp leading to the man-made walk trail underwater. As he disappeared into the waters, the instructor on the boat helped me with my helmet. he repeated the signs I had to remember while under water and reassured me that I had nothing to worry. As I climbed down one step at a time, I was cognizant of how heavy I felt. The distance between the rungs seemed more than I had expected. As I lowered myself slowly until there were no more rungs beneath, all I could see was water around me. The underwater instructor was at a little distance away from me and I could spot C waiting a bit farther at the beginning of the walk trail perpendicular to the ladder. At this point, I felt quite clueless abut how to proceed. I was apprehensive to let go of the sides of the ladder and wondered how to wade the short distance to the trail. Panic gripped me and I decided to climb up and ask for clarification. The underwater instructor seemed equally baffled and a tad annoyed with me as he quickly caught up with me above water. He impatiently explained that I had to let go of the ramp once I reached its end and hold on to his hand while he escorted me underwater to the handrail of the walkway. Oh, alright, I had not known that earlier! This time, I gingerly let go, found my hand in the instructor's firm grip, and let myself float along towards the trail. I could read C's baffled expression from behind the glass of the oxygen helmet as I joined him. Yes, "to let go" is what was required; of doubts, apprehension, and nervousness. To completely take in the beauty of nature. To admire in awe the myriad fishes of different sizes and colours that swam next you, wondering perhaps where we came from. To wonder at the sea green clear water that was lit up bright by the sun far, far above.To caress the colorful reef that swayed to the tune of the waves. To consume the quietness of a different nature. From time to time, I had to swallow my spit to release the pressure building in the ears. We walked on laboriously, firmly gripping the handrail with both hands. It was funny to note how distance and weight assumed different proportions when under water. On multiple occasions when I let go of a hand off the grip on the handrail and tried to grip back, I missed the target. I could never judge the distance. The instructor came duly to the rescue and literally guided me as one would a blind person. It was funny as well as humbling. We headed back eager to share our experience with the rest and to find how they fared. It turned out that the turtle island was a huge hit with the kids. The island housed not only a turtle conservatory farm but also a variety of other species like the bald eagle, python, and porcupine. The kids had had a riot time posing with the animals. Needless to add, another page from R's dream book had come to fruition. It was well past lunch and we certainly had no time to cover two other beaches and a temple for the day. The kids were in a mood for frolicking in the waters and making sand castles, the quintessential picture of a beach for them. So, we gave the Uluwatu temple and the sunset beach a skip to visit Pantai Pandawa beach. It should read as Pandava beach but the Balinese pronounce it as 'Pandaawa'. The beach was teeming with tourists and for a moment, I regretted our decision to choose this spot. However, the kids had a blast, getting drenching in the rising waves, and collecting sea shells and corals. We even managed to catch the Kecak dance. The start of the dance didn't appeal too much to me with the men making strange dance moves and chanting. Later, however, I was intrigued enough to watch it through as the dance drama depicting the Ramayana got interesting in bits and parts. This has been quite a long post. Hoping to wrap up this travelogue soon.